2012 BunnyLimpics Volleyball, 2 player games, Play 2012 BunnyLimpics Volleyball Game at twoplayer-game.com. 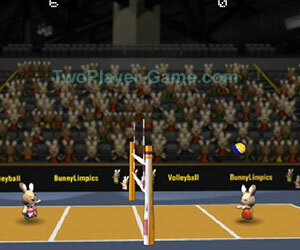 Two player volleyball game for gamer.Olympic volleyball tournament featuring real teams as bunnies. Move player with LEFT - RIGHT arrow keys. UP to jump. Your Player will play the ball automatically when he is close enough to the ball. jump to attempt to spike it. First team to 11 points wins and you have to win by 2 points.